Series 1, 86", 107", 88" and 109", 2 Litre Petrol engine. Series 2, 2 Litre Petrol engine. Series 2/2a/3, 2¼ Petrol engine. Series 2a/3, 2.6 6-Cylinder engine. Sold individually, picture is for reference purposes only. Mountings are supplied with stainless steel M10 nuts and washers. 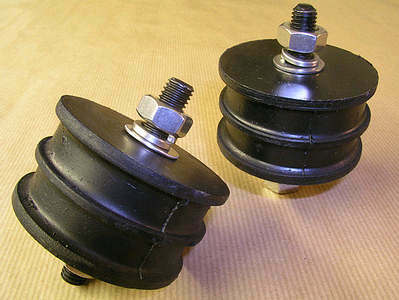 For non-Land-Rover use, dimensions are: Diameter = 2 1/2", Thickness = 1 3/8", Length of studs are 15/16".